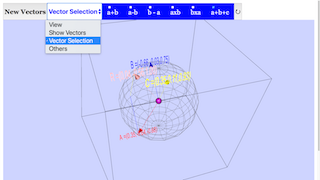 This simulation visualizes the basic vector operations in 3D. Activating the button new vectors generates vectors of random orientation, drawn as blue arrows. For better clarity all arrows have an absolute value (length) of 1 and start at the magenta colored origin. They are embedded into a sphere of radius 1, that is shown as a transparent mesh. At the start two vectors will be visible, a with red filling color of the arrowhead, b with white color. perspective: 3D projection with perspective distortion. It can be rotated with the mouse. no perspective: 3D projection without distortion. It can be rotated with the mouse. Product of absolute values: always 1, as both are of length 1. Scalar product: a∙b = a| |b| cos(a|b), with a|b the intersecting angle. Absolute value of the vector product: |a x b| = |a| |b| sin(a|b). Subtraction: b - a (= -(a - b)). Vector product: a x b.
Vector product: b x a (= - a x b). 3 Vectors a + b + c: generation of c and sum (c with yellow filling color). The chosen combination is maintained when new vectors are generated. when going from a to b and then to the vector product. E1: Generate random vectors. Rotate the sphere to have a top down look at their common plane. Estimate the angle between the vectors and compare your estimate to the value displayed in the bottom line. Experiment with the different views and reflect well what you see with every one of them. E2: The product of absolute values is displayed to be 1 (each of the 2 vectors has an absolute value of 1). Compare that to the scalar product. When is the scalar product about the same as the absolute one? When is it zero? Observe the display of the intersecting angle. E3: Select a + b in the upper row. A thin red vector is affixed to a, whose length and direction are those of b. A thick red vector starting at the origin is the sum vector. Describe its geometric construction. (mentally complete the 3 vector to a parallelogram ). Convince yourself by rotation of the frame, that a, b and a+b are in one plane. E4: Rotate the frame and observe that the parallelogram construction is valid for every projection. E5: As E3, but add a + b + c . You will see a third vector c und a sum vector a+b+c, besides the vector a+b. Observe that a, b und c in general will not lie in a plane, but form a tripod with non perpendicular axes. Perform in mind the geometric construction from a+b to a+b+c . E5: Close other options and choose a - b. A thin complement vector will appear in magenta. Convince yourself by rotating that this construction also works for all projections. Remember that a - (-b) = a + b.
E6: Chose b - a and interpret what b - a = - (a - b) means geometrically. E7: Close other options and choose the vector product a x b which will appear as a black arrow. Rotate the frame to look along the vector product. Observe that you will look perpendicular at the common plane of a and b (both vectors should touch the sphere periphery). E8: Choose new vectors several times and note when the absolute value of the vector product is very small or very large. What is the criterion? What are the possible minimum and maximum values? (a and b both have the absolut value of 1). E9: Chose b x a and interpret what b x a = - a x b means geometrically. Clicking on this button will randomly generate two new vectors for it. Toggling the combo box will give you their respective functions. 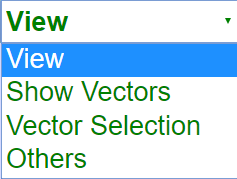 Show Vectors and Others will show you their respective information. Vector Selection will allow you to toggle the visibility of other vectors. Double clicking anywhere on the screen will toggle full screen.